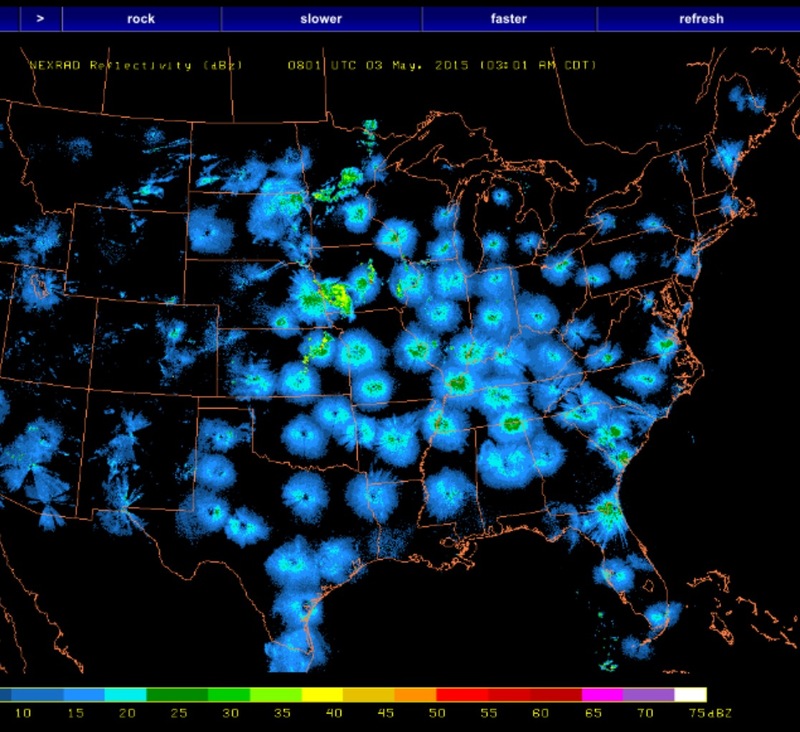 The pre-dawn radar looked promising if you live in the central flyway. The mocosocoBirds region received a meager amount of migrants but many local birds are moving in and getting settled such as Vireos, Wood Thrushes, Great Crested Flycatchers, Yellow Warblers and Common Yellowthroats, etc. Southerly winds tonight hold the promise of a sizable migration and many new birds in the region by Monday morning. Snake Hill Road and Lake Denmark Road in Rockaway Twp. : Pileated Woodpecker, Great Crested Flycatcher, Yellow-throated, Warbling and Red-eyed Vireos, Blue-winged Warbler, numerous Ovenbirds, Louisiana Waterthrushes, American Redstarts, Scarlet Tanager and Rose-breasted Grosbeak. Glenhurst Meadows: 9 warbler species including Hooded Warbler, Black-throated Green and Black-throated Blue Warblers, 9 Solitary Sandpipers, a continuing Red-headed Woodpecker, 1 singing Rusty Blackbird and a Purple Finch (Jeff Ellerbusch). Great Swamp NWR: Spotted Sandpiper, Greater Yellowlegs, Yellow-throated, Blue-headed, Warbling and Red-eyed Vireos, Marsh Wren, Northern Waterthrush, Scarlet Tanager, Rose-breasted Grosbeak, Orchard and Baltimore Orioles (Simon Lane). Melanie Lane Wetlands: 2 Green-winged Teal, 3 Killdeer, 1 Solitary Sandpiper, 2 Greater Yellowlegs, 3 Lesser Yellowlegs, 5 Least Sandpipers, 2 Wilson’s Snipe. Susan Treesh reports that Grasshopper Sparrows are back in the “main path” field at Negri-Nepote Native Grassland Preserve as of Saturday, May 2. This writer will give a talk Thursday, May 7, 2015 at 7:00 PM at the Morristown and Morris Township Library. The topic is Introduction to Birding: May Migration. Details and directions can be found here.